Azerbaijani Embassy in Uzbekistan held a holiday event due to National Flag Day on Friday. In the courtyard of the Azerbaijan Cultural Center named after Heydar Aliyev, where the event was held, was installed a banner with the image of the State Flag Square of Azerbaijan in Baku, on a huge screen were shown film of the opening ceremony of the State Flag Square on September 1, 2010. To the foot of the monument to national leader Heydar Aliyev, set in front of the Azerbaijani cultural center were laid a wreath and flowers. The event participants sang the anthem of Azerbaijan and give a minute of silence in memory of those who died for the independence and territorial integrity of the country. Before the gathered in the center activists of the Azerbaijani Diaspora, Azerbaijani students studying in universities in Tashkent, the media Azerbaijani ambassador in Uzbekistan Namig Abbasov speaked. Namik Abbasov congratulated those present on the occasion and noted the importance of studying and promoting symbols of Azerbaijani statehood and stressed the importance of the entire infrastructure Flag Square, initiated by President Ilham Aliyev, to strengthen the sense of respect for the people of their state symbols. 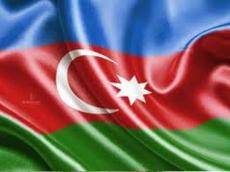 "Order of President Ilham Aliyev's annual celebration on November 9 of the State Flag of Azerbaijan plays an important role for the growth of the country's prestige and respect for our independent state in the country and abroad," said Abbasov. Guests of the event were provided with information about the history of the national flag, the meaning of its symbols and colors of the flag of the technical parameters established in the square. The holiday ended with a concert with the participation of Azerbaijani and Uzbek artists, student groups Tashkent Pedagogical University named after Nizami, Tashkent Choreographic College, dance group "Azerbaijan gyzlary" under the direction of Honored Artist of Azerbaijan Kekab Aliyeva.